Last year, the Oklahoma Supreme Court ordered removal of the Ten Commandments monument from the State Capitol grounds. The monument now sits along Lincoln Boulevard about a mile south of the Capitol, in front of the offices of the Oklahoma Council of Public Affairs, a conservative think tank. State Question 790, which speaks to separation of church and state, has been overshadowed by other hot-button proposals on the Nov. 8 ballot proposals such as a penny sales tax for education and the sale of wine and strong beer in grocery stores. Yet it raises fundamental issues about church-state collaboration and could have significant long-term consequences. Here is a look at the history of the ballot question and arguments raised by supporters and opponents. Q: What would SQ 790 do if passed? Q: Why was it placed on the ballot? A: The Oklahoma Legislature voted in 2009 to allow the display of a Ten Commandments monument on the grounds of the Capitol. Three years later, a privately donated monument was erected near the Capitol’s north entrance. In 2015, the Oklahoma Supreme Court, in a 7-2 ruling, said the monument violated Article 2, Section 5. The monument was relocated to private property several months later. Q: Was that the first time the Oklahoma Supreme Court ruled on a religious monument? A: No. In 1972, the Supreme Court approved the placement of a 50-foot Latin Cross at the state fairgrounds in Oklahoma City. It said the display did not violate Article 2, Section 5 because a cross is not necessarily an explicit endorsement of a particular religion and because the fairgrounds are a quasi-commercial setting. Q: Has the state Supreme Court made other rulings based on Article 2, Section 5? A: Yes, with varying outcomes. In 1946, the court held that state payments to an Indian orphanage run by Baptists in Atoka did not violate the constitution because the state was receiving valuable services in return. In 1959, it said state funds could be used to build a non-denominational chapel at the Whitaker State Orphans Home in Pryor. In 1963, the court said the Midwest City public school district could not provide free bus transportation for students of a local Catholic school. Earlier this year, the court ruled that Article 2, Section 5 did not prevent the state from providing scholarships to disabled students who attend religious schools. Q: Who publicly supports the question? A: OCPA Impact, the political advocacy arm of the conservative Oklahoma Council of Public Affairs, which allowed the monument to be placed on its property down the street from the Capitol. The executive director of the Baptist General Convention of Oklahoma, the archbishop of the Catholic Archdiocese of Oklahoma City and the bishop of the Diocese of Tulsa also are proponents. Former Gov. Frank Keating, who established a state Office of Faith-Based and Community Initiatives during his tenure, also supports the measure. A: The American Civil Liberties Union, which helped file the lawsuit challenging the monument, and the Oklahoma chapter of Americans United for Separation of Church and State are opposed. Also the Baptist Joint Committee for Religious Liberties in Washington, D.C., the Interfaith Alliance Foundation of Oklahoma, the Tulsa Interfaith Alliance and the Oklahoma chapter of the Council on American-Islamic Relations. Q: Would passage end the separation of church and state in Oklahoma? A: No. Oklahoma would still be subject to the First Amendment of the U.S. Constitution, which prohibits Congress from passing laws “respecting an establishment of religion, or prohibiting the free exercise thereof.” In May, Oklahoma Attorney General Scott Pruitt said the First Amendment would still prevent government “from endorsing a religion or becoming overly involved with religion” if SQ 790 passed. Q: Has the U.S. Supreme Court ever ruled on Ten Commandments monuments? A: Yes, and the record is mixed. On the very same day in 2005, the nation’s high court ruled that a Ten Commandments display at the Texas state capitol was constitutional, but two Ten Commandments monuments inside county courthouses in Kentucky were not. The court based its findings in part on the different histories and contexts of the Texas and Kentucky displays. Q: Why are some opponents calling SQ 790 a Trojan Horse? A: Because they say its passage could open the door to state spending on other forms of religious activity in Oklahoma, particularly in the education sphere. If the authors of the ballot measure had only wanted to allow a Ten Commandments monument at the Capitol, they could have written a proposed constitutional amendment authorizing that, opponents contend. Instead, they opted to strike Article 2, Section 5 in its entirety. Q: Would passage clear the way for the state to provide tax-financed vouchers for private education? A: A limited form of vouchers already is on the books and has survived a Supreme Court challenge. The Lindsay Nicole Henry scholarship fund provides taxpayer money to help parents enroll disabled children in private schools. In its February 2016 ruling, the Supreme Court said the program did not violate Article 2, Section 5 because the choice of schools is made by parents, not the state. Some opponents of SQ 790 predict its passage would enable lawmakers to enact more sweeping voucher programs. Q: Do supporters of SQ 790 cite any benefits beyond a Ten Commandments monument? A: Legislative sponsors of the ballot question legislation said last year’s Oklahoma Supreme Court ruling would “potentially make our state hostile to religion and have damaging impacts on our counties, cities and school districts.” Some SQ 790 advocates assert that Article 2, Section 5 might be used to challenge Medicaid payments to religious hospitals, the Oklahoma Promise scholarship program and state payments to religious after-school providers and prison ministry programs. Q: What is known about the original intent of Oklahoma’s constitutional provision? A: Some supporters say Article 2, Section 5 is the legacy of the late 19th Century “Blaine Amendment” movement designed to prevent the use of tax money to support Catholic schools with large immigrant constituencies. But the ACLU says that characterization is inaccurate. It says Article 2, Section 5, was crafted in 1907 by community leaders, clergymen and Native Americans who wanted to keep politics out of religion. Among other things, some of them were concerned about government-financed schools that attempted to force Christianity on native children. Q: If SQ 790 passes, will religious groups be able to erect more public monuments or file more lawsuits? A: Possibly. A group of Satanists applied for permission last year to erect a monument of a goat-headed deity on the Capitol grounds. 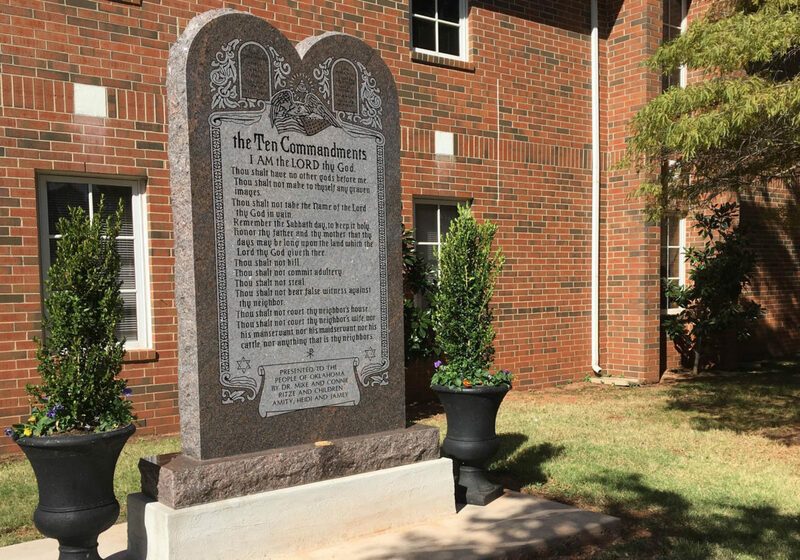 It withdrew the request after the Supreme Court ruling against the Ten Commandments monument. Although it appears unlikely that state officials would approve monument requests by Satan worshippers or other fringe sects following approval of SQ 790, their refusal to do so could lead to more litigation. If the Ten Commandments monument were relocated to the Capitol, that might cause opponents to file First Amendment challenges. Q: Do other states have constitutional restrictions like Oklahoma’s? A: Yes. In the 19th and 20th centuries, more than 30 states adopted similar “no-aid” provisions to limit public spending for religious purposes. Legal scholars say most of those provisions remain in effect.